If you have Media Player adware application installed on your computer, you will be spammed with Media Player Pop-Up Ads. The ads will be labelled as “Ads by Media Player” and they will be extremely intrusive – you will notice from three to five commercial advertisements per page. Do not be surprised if Media Player Pop-Up Ads open new tabs that redirect you to potentially malicious websites. It is necessary to remove Media Player Pop-Up Ads from your computer if you intend to protect the system from any potential harm. Therefore, if a malevolent third party embeds corrupted links into Media Player Pop-Up Ads, then the application will indirectly become a link in malware distribution network. Technically, the main objective of Media Player Pop-Up Ads is to generate financial revenue to its creator by displaying the pop-ups and making you click them. Thus, it does not care exactly what kind of content it promotes, and eventually you click the pop-ups on your own risk. Removing Media Player Pop-Up Ads may not solve all your problems. Due to the fact that this adware application usually arrives bundled with freeware, you are bound to have other potentially dangerous programs installed as well. 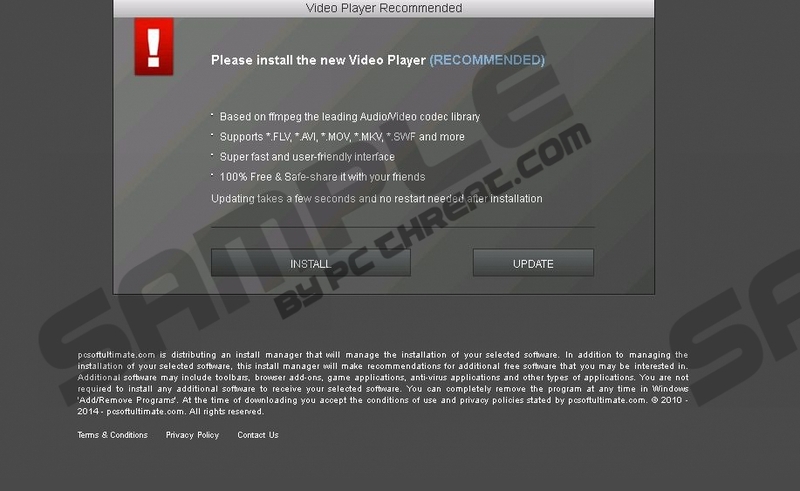 For example, Media Player is known to be bundled with YouTubeAddBlocker which is an adware application on its own. Hence, delete all the unwanted applications in a go and then scan your computer with a reliable antimalware scanner that will detect any remaining dangerous files. We provide manual removal instructions for Media Player below. Once the program is removed via Control Panel, the extensions in your browser should disappear as well. In case you have any specific questions, do not hesitate to leave us a comment and we will reply as soon as possible. Always use the Internet safely and finally, to ensure that your computer is safeguarded against malware, invest in a licensed security tool. Slide your mouse cursor to the bottom right corner of the screen. Click Settings on Charm bar and then go to Control Panel. Select Uninstall a program and remove Media Player. Go to Uninstall a program and remove Media Player. Quick & tested solution for Media Player Pop-Up Ads removal. It seems that Media Player isn't installed on my computer but it pops up wanting to be installed so how can I get rid of that popup please. I can't find Media Player anywhere in the control panel. I went to install/uninstall and still can't find it. Could it be under another name?